Almost everyone in this room is non-athletic and looks a little like me. None of the jocks from my elementary school in Texas had the calling to enroll in introductory strings. I’ve spent the rest of my life coming to terms with Number One. My reaction to the precariousness of holding the bow was to shy away from full, unencumbered movements. Every exercise not only suggested the correct way of doing something, but also imposed limits which later made it more difficult to discover the true nature of the bow. For instance, while I learned how to draw a straight bow, I spent years unlearning the side effects: scraping the string, the hair and the string being too tightly wound around each other, etc. 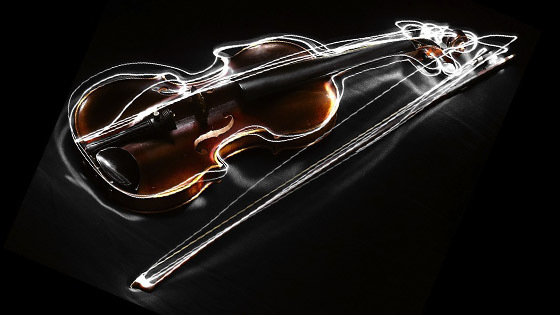 The greatest truth I learned from playing the violin and making music is that, as difficult as they are, it is important to strive for the instrument's full potential. How can you listen to Itzhak Perlman playing the great music from the movies with John Williams conducting, and not hear the richness of his sound and the unlimited possibilities? I always thought the bow was so fragile and mistake-prone. How many times did it bounce and send me into panic mode? However, that is the primary source of the bow’s magic. To swoop into the string for a sudden accent; to change direction and continue the soaring sound of an ever-uplifting phrase. Bows bounce! It’s as simple as that. Wind players manipulate tongues and mouths, I guess. String players have to embrace the fact that we’re working with a trampoline. Even when we’re not "bouncing", we’re still bouncing. We’re just not in the air. I went into the aquarium shop to ask the owner why a couple of my fish may have died within one week of each other. I asked if I may have had too many fish in the tank, or that I wasn’t feeding them enough. He said "Fish Die." Thank you. For some reason, that was the perfect answer. I played for years with a Playonair, the shoulder pad that’s like a pillow. It had fallen off numerous times. After years of frustration I had finally reached my limit. It fell off for the last time during an orchestra concert when we were on tour. I simply left it on the floor and returned to Los Angeles. My thought was that the violin is difficult whether you use a shoulder pad or not. I was happy to make it a little more difficult but never ever have to deal with something falling. In music as in aquarium life, our lack of knowledge shouldn’t limit us or scare us in any way. Instead, it should make us want more and never be afraid. December 31, 2017 at 06:19 PM · To "want more and never be afraid" is a great way to not only look at violin playing, but at life in general. This may well become my mantra for 2018. Thanks for another great article! January 1, 2018 at 12:05 AM · Thanks for a fun read! After about 30 months of playing (most of that time without a shoulder rest or chin rest), I am still getting the feel of the instrument and the bow, but so far it has always been an adventure and I enjoy your article for conveying that the adventure (and learning) never seems to end even after a long time with the instrument. January 1, 2018 at 01:12 AM · Hi 76...99, I can't tell you how many times it was hard to keep playing when the difficulties seemed insurmountable. But as we all know, the charms of music are pretty irresistible. Just when you think you want to quit, miraculously you have some kind of breakthrough. January 1, 2018 at 01:23 AM · Will, I trust you will always have a good adventure when it comes to learning the violin. One bad adventure I had was when a teacher in college had me remove my shoulder pad, and insisted that I not let my violin rest on my shoulder. Though it's not necessarily a bad idea, it was wrong for me. And worse, I didn't just say no. Fortunately, years later a teacher told me to change my bow hold to match his, which was grotesquely shaped. (It happens. Tossy Spivakovsky played with somewhat of a claw) I said no. January 1, 2018 at 07:45 PM · The comment above is wonderful! Perhaps an alternate title is: "Fish Die, Bows Bounce, Life Goes On." January 1, 2018 at 11:41 PM · Never again will a bouncing bow dampen out spirits. Now a squeaky, whistling E string. That's a deal breaker!